Become a Premium Member and post notes and photos about your poem like wayne tolbert. Note:  This poem was originally posted on April 4th and reposted now so the photograph can accompany it. as mornings grow colder i am reminded of a woman curled next to a steam vent in an effort to warm herself. 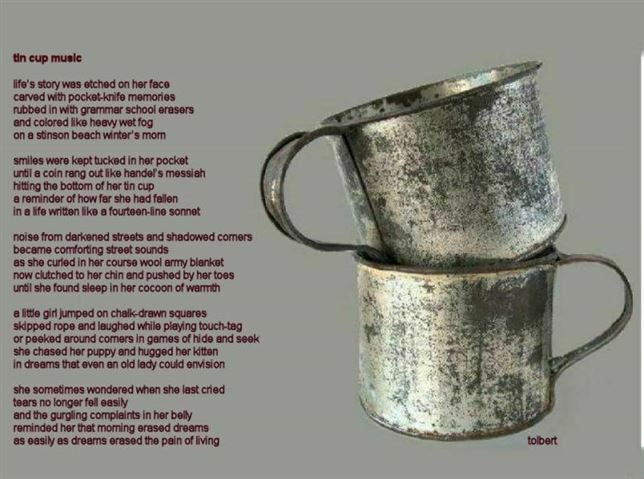 a small tin cup like you might find in an army surplus store was positioned near her exposed face as the cold nipped away at her dignity. some faces are unforgettable. hers was one. So sad the way we treat some people in our society. Very thought provoking poem. Have a good day. Thank you for reading and commenting David. Yes, it is sad and somehow I fear the situation is worsening...May little acts of kindness fill each of our days...Thanks again and you also have a wonderful day.